most complex cases can take up to two years to complete. We complete the majority of our Invisalign cases in under 12 months. Furthermore our patients can take part in the planning process to eliminate unwanted changes and thereby greatly shorten the treatment time and cost. Second - "How much does it cost?" The simplest cases which can be treated with Invisalign Express and take under 5 months cost just $2900 while normal cases range from $4200 to $4800 depending on complexity. Our average cost per case is $4500 which is less than most offices charge for braces. Third- "What are the payment options for Invisalign?" We have recently teamed up with Chase financing which allows our patients to have Inivisalign with zero interest for up to 24 months. This means for around $180 a month you can have straight teeth. We also offer a prepayment discount for patients that pay for the whole treatment when we start. Basically if you want Invisalign our staff will be happy to work with you to find the best way for you to get it. Fourth- "Does my dental insurance cover Invisalign?" The answer here is it depends on your plan. 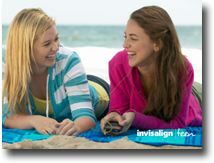 Plans that have Orthodontic coverage help pay for Invisalign instead of braces. Our staff can easily check you plan to tell if you can get help from your plan for your Invisalign treatment. Please call us at 941-5555 for a complimentary consultation.